The syllable ओ३म् (ॐ) is not just a word or sound but the pure consciousness of the entire cosmos that we feel, touch, hears or enjoy. Sarvam Omkara eva: Everything is Om, indeed (Ref. Mandukya Upnishad). Is ओ३म् (ॐ) everything?? That means whatever is visible, whatever is perceptible or identifiable, whatever can come within the purview of sense organs, if it is comprehended under the single term, then, it is “creation” – all this is ओ३म् (ॐ)?? If you ask me, then yeah, it is. 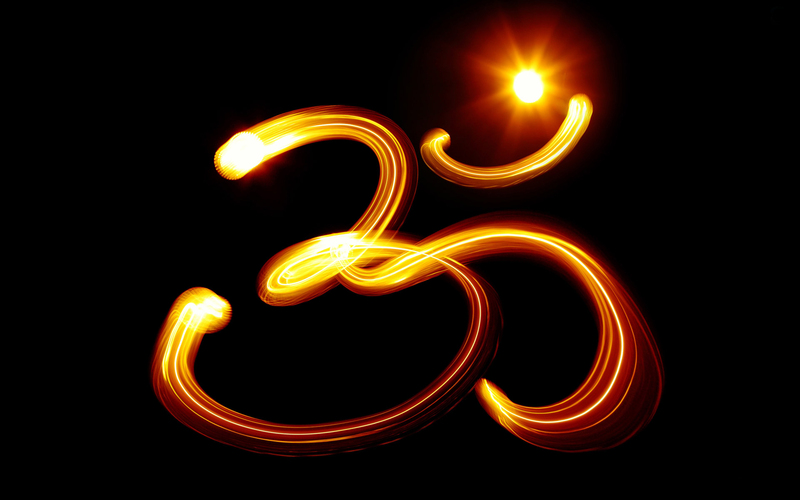 In this article, we will try to apprehend the AUM(OM) / ओ३म् (ॐ) and its significant facts. Fact1: What is the Symbol AUM(OM) / ओ३म् (ॐ) representing? It has indivisible and significant three states and a state beyond. A—U—M—Silence. It represents the four states of the Universal Self, Atman OR the Brahman, the Absolute Reality of life as A (Waking), U (Dreaming), M (Deep Sleep), and Silence (Turiya). Om is said to be Pure Consciousness / the real self / the Atman / Brahmana inside the body. That Self is experienced on four levels. 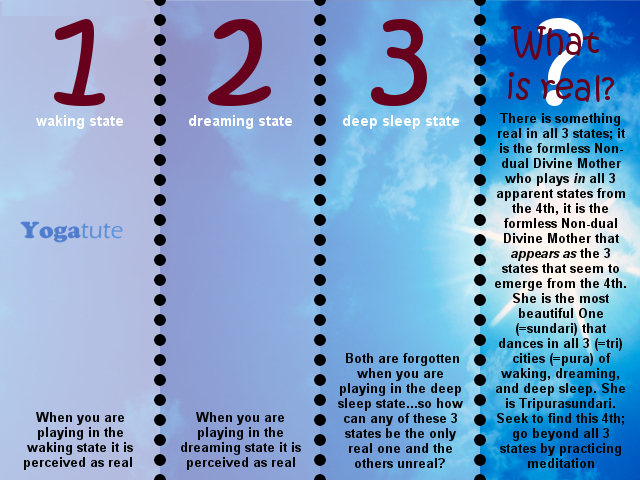 Three of the states are those experienced during waking, dreaming, and deep sleep, & the fourth state is beyond. The experience of waking merges into dreaming, dreaming merges into deep sleep, and ultimately deep sleep merges into Silence/Turiya. Thus, Turiya encompasses all other states. When you analyse the experiences of the different states of consciousness, or consciouness in totality, you attain the fourth state, Silence (Turiya). i) A (Waking State) – The Sound “A” is the first state of OM. It pervades all other sounds. Without the first syllable A, one cannot utter the word OM, and likewise, without knowing the Waking state one cannot know the other states of the consciousness. One who is aware of this first level of reality has fulfillment of all his desires and is successful. ii) U (Dreaming State) – The consciousness experienced during the dreaming state is “U”, the second letter of OM. This is an intermediate state between the waking and sleeping states. One who knows this subtler state is superior to others. When the aspirant becomes capable of analyzing the nature of U or dreaming reality through pratyahara practice or Meditation, he attains mastery over his unconscious mind. The aspirant then overcomes negative mental attitudes such as friction, jealously, hatred. U, the intermediate state, is more subtle and superior than A. It deals with the world as comprised of ideas rather than objects and is thus closer to the truth. Our world is an idea first (and then objects) that builds each and every structure of the world. Thus, idea is the architect and is superior to the construction. Thus, U is superior to A, in A-U-M.
iii) M (Deep Sleep)– For knowing OM in a comprehensive way, one has to move to higher dimensions of consciousness, which mean here sleeping state, represented by the letter M, the last letter of OM. After, experiencing all the joys and pleasures of the external world, finally one delights to have deeper quality of joy during sleep. By repetiting OM Chant, A and U become one sound and submerge into M. The pronunciation becomes OMmmmm…, thus A and U are dissolved into M and again evolved from M. Therefore, one who realizes the nature of the internal and external worlds. He is also able to realize his oneness with the entire universe and definitely superior to one who has explored only the internal states (waking and dreaming states). 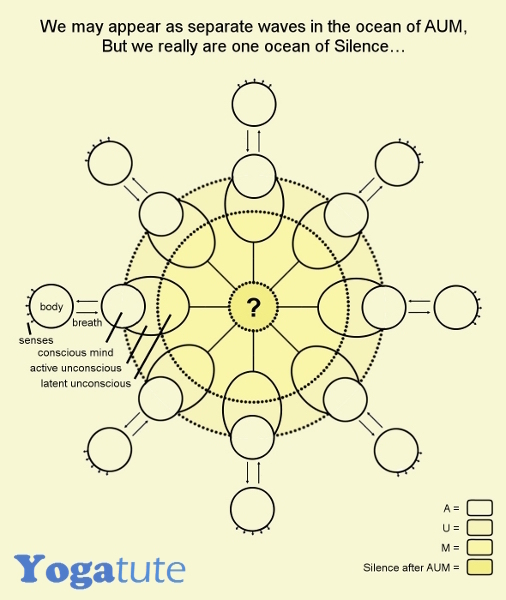 iv) Silence – In the final state of OM, A-U-M merged into Soundless sound of OM, which is silence. It is incomprehensible, being beyond speech and mind. It is the state of self-realization in which all doubts and conflicts are resolved. It is blissful state that is the cessation of the influence of the grand illusion (Maya). It is identical with Atman, the very Self of all individuals. HE who knows this state of Absolute Reality expands into the Supreme Self and is not born again. Thus, SILENCE (? ), is the supreme, fourth state of the syllable / OM, along with three states A-U-M / ओ३म्. Fact 2: AUM – the primordial sound that creates this universe. When we utter A, B, C, etc., a particular part of the vocal system begins to vibrate, but when you recite OM, the entire sound box begins to vibrate. This is a matter for experiment. Anyone of you can experiment with it and observe the result. The whole soundbox begins to function, not merely a part of the soundbox; and all the languages are supposed to be contained in Om because of the fact that in the recitation of Om every part of the vocal organ begins to vibrate, and naturally every word, every phrase should be somehow included in the root-sound that is created when Om is chanted. For example, by chanting “aaaaaaa”, one can feel the sensation and hence resonance of nervous system in the stomach and chest region. Chanting “ooooo” creates sensations in throat & chest region and resonates with them. Similarly, chanting/humming “mmmm” resonates with the nasal cavity as well as skull/brain region. What happens when we concatenate (join together) the above syllables into one mantra? We get the AUM mantra which when chanted sequentially activates the stomach, spinal cord, throat, nasal and brain regions. The energy moves from the abdomen all the way up to the brain, thereby channelizing energy and activating the spinal cord & brain. 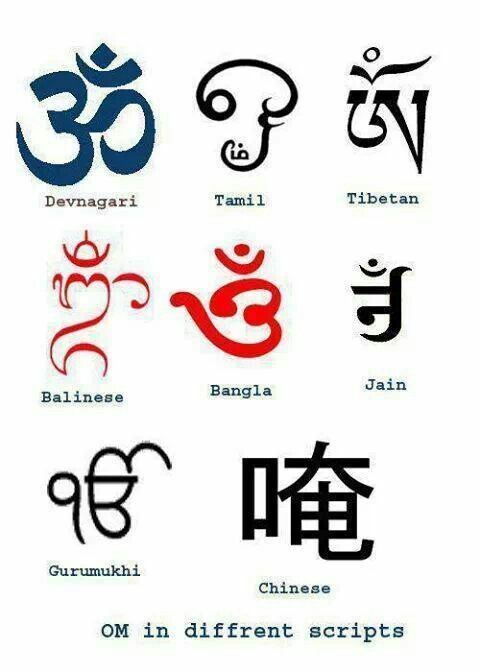 Fact 3: OM does not belong to any particular language or community. OM as a syllable, as a symbol or as a sound does not does not belong to any particular language. When one studies about it, they found it is the knowledge of all the levels of realities- gross, Subtle, most Subtle, and beyond. 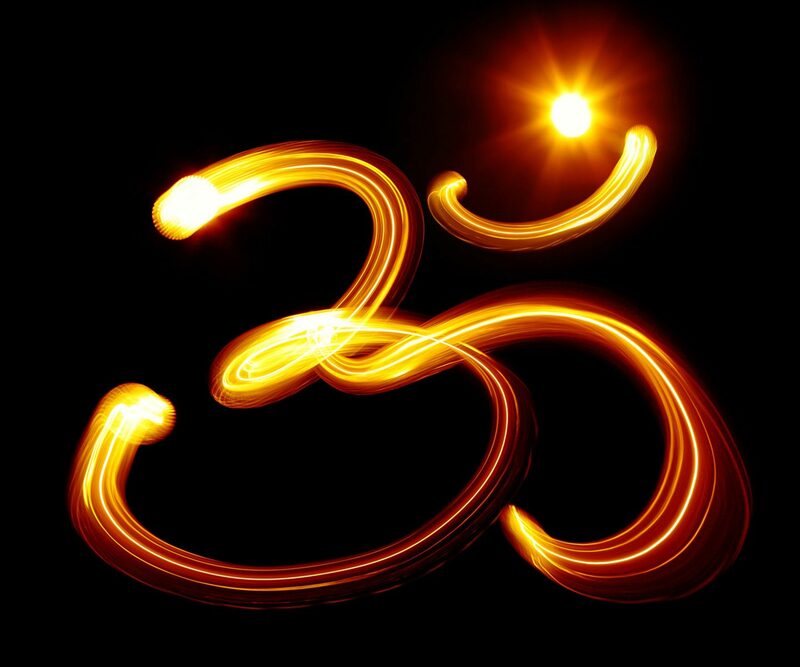 If Om is a word, the whole universe is its explanations. If it is a sound, the whole universe is its Vibrations. In other words, OM is a manifested and unmanifested knowledge that could not be expressed by any particular language. Also, the human language is found to be so shallow, that most of the desires, thoughts, and feeling remains buried in the supreme library of the unconscious and only a very little part of it can be expressed. Fact 4: OM Chant is a direct roadmap to achieve or experience Deeper Truths or Self Realizations. The OM Mantra chant is regarded as direct path to achieve Sadhana, spiritual practices, the depth of the Absolute Reality, the deeper truths or Self Realization. 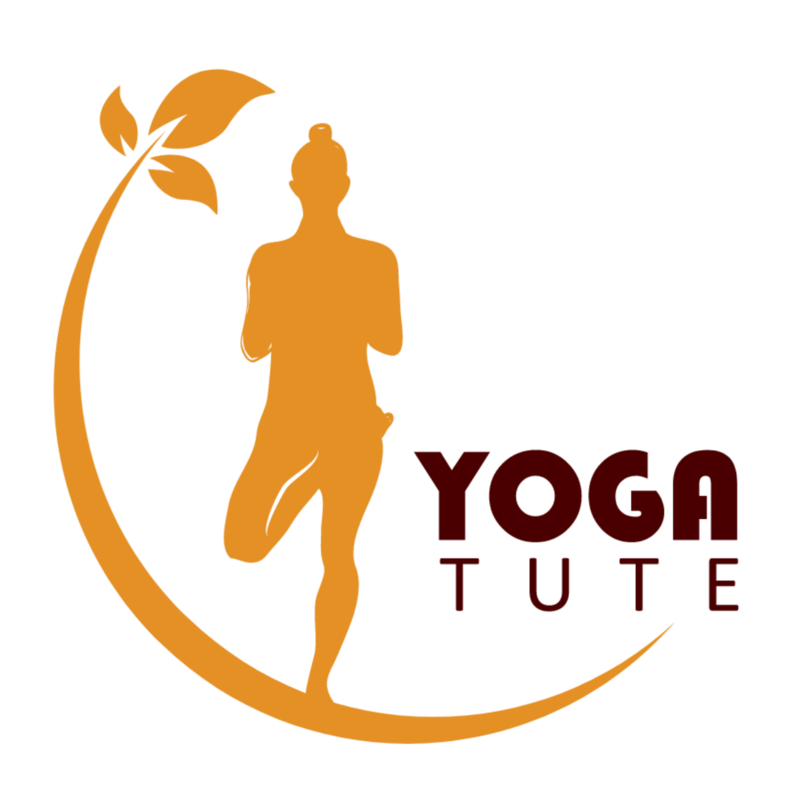 As per Yoga Sutra, for deeper experience, Practice OM Chant with deep Feeling for the meaning of what it represents. Patanjali Yoga Sutra (1.28) suggested that it is important to remember not only the vibration (Japa), but also the deep meaning of the mantra, rather than to perform merely parrot-like repetition in the mind. Bhavanam- understanding with feeling/absorbing and dwelling upon. To understand the deep feeling for the meaning of OM, the 7 states of consciousness in OM Mantra is suggested. 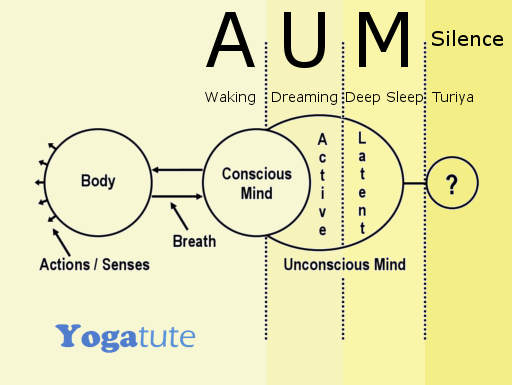 Three states of consciousness: Each of the three sounds of AUM Mantra (A, U, and M) symbolizes specific states of consciousness. Fourth state of consciousness: After those three parts of the OM Mantra, there is a Silence, the Fourth, which relates to consciousness or awareness itself. Three transition states: Between these four states of Consciousness there are three transition states. It is important to be aware of the fact that these levels of consciousness are realities that exist universally, regardless of whether or not one uses the OM Mantra or the visual OM symbol in any way. In either case, the underlying principles are extremely useful for all seekers in purifying or clearing the mind, and seeking the direct experience of deeper truths. Fact 5: Methods of OM Chant Practice plays important role in deeper or richer experience. Use a speed that is natural and comfortable: There are many rhythms in the body and mind, both gross and subtle. Imagine the sound of OM, rising and falling, at whatever speed is comfortable and natural. It may be very fast, several cycles per second. Or it may be slower, several seconds for each cycling of OM Mantra. Or it might become extremely slow, with the mmmmmm… sound continuing in the mind for much longer periods, but still pulsing at that slow rate. MEDITATION TIME AND DAILY LIFE: This kind of awareness of the OM mantra can be used both at meditation time and during daily life. The OM mantra is allowed to be somewhat of a constant companion. It brings a centering, balancing quality to daily life. This does not mean being in a dull, lethargic state. Rather, done well, it brings clarity of mind and a greater ability to be in the world, and selflessly serving others. Breaking habit patterns: This is not intended as a blocking mechanism to prevent dealing with one’s thought process or with the challenges of life. It is not a method of escapism. However, it definitely can have the effect of bringing focus to the mind, which can break a pattern of disturbing or distracting thoughts coming from the noisy or chattering mind. In this way, one has a greater openness to being aware of positive thoughts and spiritual realities that are always there. Another Method is to close the ears with index finger while chanting as humming bee OM sound. Follow the breathing as above. Mind, breath, and mantra in unison: In this practice, you come to experience the mind, breath, and mantra flowing in unison. This synchronization has a beautiful effect on meditation. Simply allow the OM Mantra to come and go with each inhalation and exhalation. Allow there to be no gap, no space, no pause between inhalation and exhalation, or between exhalation and inhalation. The speed naturally slows: As you gently allow the OM mantra to flow with the breath, the mind becomes calm. When the mind becomes calm, the body relaxes, and the breath becomes even soother and slower. That rate of speed at which the OM mantra is being repeated naturally slows down. It is not a matter of forcing the mantra to slow, but rather, this slowing comes quite naturally. Allow the mind to stay wide awake and alert, as the OM mantra and breath become naturally slower and slower. Meditation will deepen. Obstacles will be removed . How to Meditate? The Way of Meditation? I am ending the article with the proverb, “OM as a word, which can explain the whole Universe”.